Hiemstra is a well known South African paint, cartoon and caricature artist. 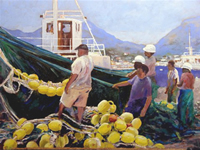 His paintings can be seen all over the country and in overseas homes. Cartooning, which started at school, was initially the main focus for many years to come. Louis was the appointed cartoonist of the University Newspaper whilE studying in Pretoria, and is now the author of a weekly comic strip for the Volksblad daily newspaper in Bloemfontein. He is well known locally for his FunART signage! He added more formal painting to his skills since the late seventies and has since exhibited in many national and other exhibitions. 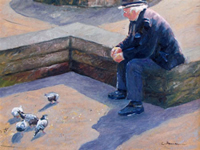 His paintings can be seen all over the country and in overseas homes. 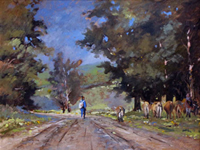 He is now a Fellow of the Watercolour Society of SA and still partakes in National exhibitions. He occasionally serves as selector of national exhibitions of the WSSA. He also paints in other favourite media. To these he added book illustrations of which 4 books with illustrations have been published.